Mike at My Diabetic Heart has proclaimed this week to be Diabetes Blessings Week. 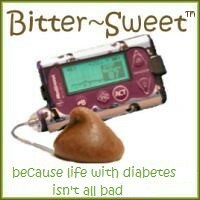 Time to reflect on the blessings that have come to us because of diabetes. I’d like to post seven, one each day this week, but I can’t promise I’ll be diligent enough to post every day. We’ll just have to see how that goes . . .
Today I am thankful that although I have diabetes, I have also been blessed with a really good tolerance for handling very low lows. Take, for instance, Friday night when I was home alone (okay, knitting) and was surprised by this, out of no where, on my meter. Yes, it sucked. I got really really scared. I cried. I ate more than I should have. I realized why I has spent the past hour overwhelmed by paranoid thoughts that 1) Pete would have a terrible car accident on his drive home and 2) every tiny noise outside meant someone was trying to break into my house. But, I was okay. I was able to function. I was able to get myself frosting . . . . and Skittles . . . . and Swedish Fish. My blood sugar was 22 but I could fix it on my own. This is not to say I haven’t had a few bad experiences with lows. 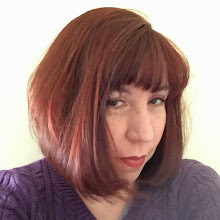 In 31 years, I have had one seizure that led to a quick trip to the ER. I can think of three times when I was too disoriented to help myself - once in high school, once in college and once about a year ago. I’m careful to take every low seriously and remember how dangerous a low blood sugar can be. But today, I’m giving thanks that I tolerate lows really well 99.9% of the time. I am blessed that, although diabetes has brought low blood sugars, it has also brought me the ability to treat them when I need to. Diabetes has definitely help me understand the need to be more tolerant and patient. Whoa. Karen. Next time, CALL ME! The best thing when I'm low and alone is to talk to someone... makes a HUGE difference! Otherwise, I guess this is something I'm thankful for also...I have not had a "bad" low since I was first diagnosed. This is something I'm thankful for as well, and probably take for granted. The only times I've been low and unable to help myself were when I was still quite young, and asleep. Thankfully, my parents found me both times. Thank you for sharing your fears. I know how scared Sugar gets when she sees a 50 or below. It shatters my heart every time. Wow kudos to you for handling them. I've never heard of anyone else talking about the paranoia you get when a low is creeping in. I get that too, I get jumpy and afraid and often times i have no idea why until the low symptoms finally set in. Glad I'm not alone. Yikes! Scary! So glad that everything worked out Ok.